Personally, I'm a big fan of slots that have a solid theme but I prefer slots that put game play before the theme. Ideally, you want both but if you have to have a choice between the two then game play is certainly the preference. 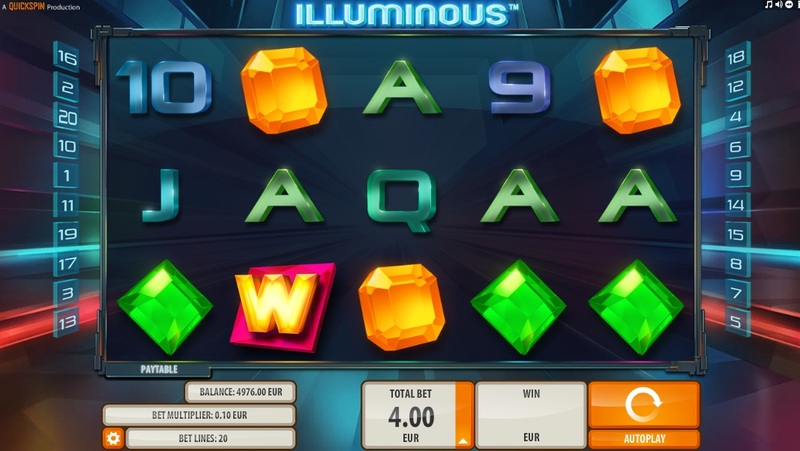 Luckily for me, established developer Quickspin are keen to put the game play first in this Illuminous slot. 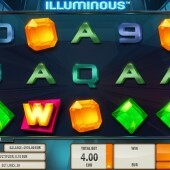 Illuminous is a 5 reel, 20 payline slot that does not really have a set theme as such. I suppose you could argue that it is quite futuristic with an emphasis on bold colours and a metallic background to the reels. The symbols on this slot are not the most creative ones you will come across. There are different coloured gems including blue, green, orange, and pink ones. The regular 9-through-to-Ace symbols fill up the other positions on the reels. The Wild symbol is represented on the reels by the big yellow “W” symbol. It substitutes for all other symbols, except for the Bonus Wild Scatters, to complete any possible winning combinations that appear on the reels. Bonus Wild Scatters... All In One! Now, the Bonus Wild Scatters are a symbol that is made up of three words we often see acting as separate symbols on a slot so to see a symbol with the power of all three is very exciting. These are represented by the yellow “W” symbol with the word “Bonus” written below it. It acts as a Wild symbol and substitutes for all other symbols, no exceptions. The first influence a Bonus Wild Scatter symbol has is that it can trigger the Hot Reel Re-Spin. This is triggered if you land two Bonus Wild Scatters on the reels in a single spin. It kind of acts like a consolation prize for not quite triggering the Hot Reel Free Spins. When triggered, the Hot Reel Re-Spin will see the two reels containing the Bonus Wild Scatters add additional Wilds before the remaining three reels re-spin. The Hot Reel Free Spins is then triggered if you manage to hit three or more of the Bonus Wild Scatters across the reels on a single spin. You will be awarded 5 free spins initially. The reels that contained the Bonus Wild Scatters that triggered the free spins will then have additional Wilds added to them for the whole of the free spins bonus round in a similar way to how they were added for the Hot Reel Re-Spin. On the visual front, this slot looks very much the same as slots such as the poorly-received Gem Drop by Play'n Go and the electric Neon Staxx slot from NetEnt. However, this game plays very well. The re-spins and the free spins combo ensures that you are busy on almost every spin and the Extra Wilds thrown into both of those features give you a lot of action to deal with when the bonus features are triggered. This is a hit out of nowhere.